Surfometer® System 3 is a skidless measuring instrument designed to check the roughness average for small, difficult-reach surfaces. The motor drive is mounted on a granite base to minimize vibration and to provide a level, stable surface for locating the work piece. 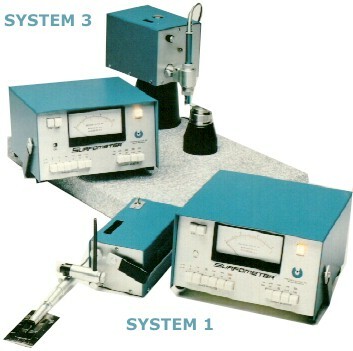 Surfometer® System 1 is a skid-referenced instrument for measuring Ra (roughness average). The analog system continuously averages the Ra value over the selected tracing length. This system is designed to check the roughness average for small, difficult-to-reach surfaces. The motor drive is mounted on a granite base to minimize vibration and to provide a level, stable surface for locating the work piece. PDK. The versatile PDK tracer, with the single SMT skidmount, can measure a 1/8 in. I.D. and O.D. to flat surfaces. The PDK has a series of standard, interchangeable double skidmounts available for most surface texture requirements. PDM. Rugged and durable, the PDM style tracer provides accurate reading throughout the surface texture measurement range. From super-fine to high micro finished, the PDM tracer offers the reliability for critical surface evaluation. Standard skidmounts permit measurements on outside diameters as small as 1/8 in to inside diameters from 1 13/16 in to flat surfaces. PDG. The PDG tracer does not use skids, but has various standard stylus assemblies that mount onto the tracer beam. 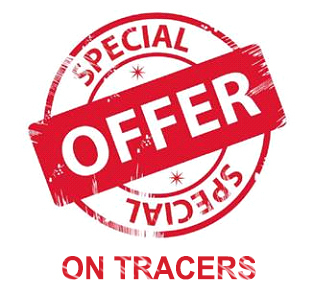 Other standard tracers and accessories are available based upon specific applications. 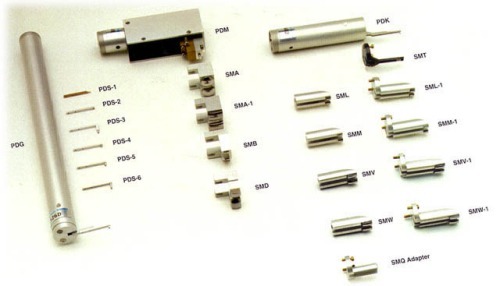 If a standard product does not meet your exact need, Precision Devices, Inc. will design and build a tracer or stylus assembly that will satisfy your requirements. Standard (shown), special tracers and stylus assemblies are also available. Contact your Precision Devices, Inc. representative for additional information.